Many foreign travelers hesitate coming to Russia due to its stringent visa requirements. 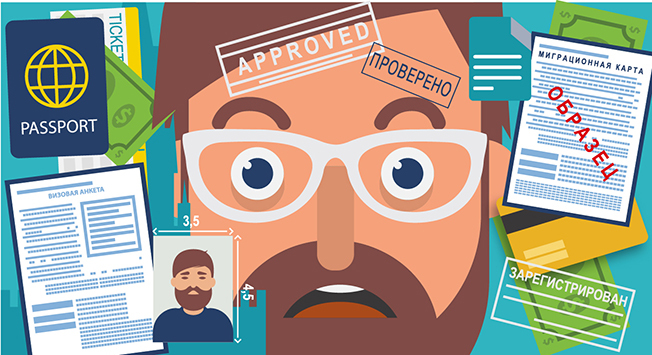 Here you can find everything you could ever possibly need to know about Russian visas boiled down for you by RBTH. Visitors from many Latin American countries can breathe easily: It is likely that you won't need a visa. To make sure, check the Russian consulate website in your country. Here we will inform visitors from the majority of countries about the major procedures and documents needed for the application process. Make sure there are at least two blank pages in your passport for visas and that the passport expiration date is at least six months after the visa expires. You can find a visa application form on the website of the Russian embassy, consulate or visa center for your country. You will be required to provide general information about yourself and your planned visit to Russia. Tip: In some countries you may be required to give details of all your trips abroad over the last 10 years. This is especially true at British and American visa centers, so make sure to prepare a comprehensive list of countries and dates. The picture must be clear and sharp, against a light background and the applicant must not be wearing any headdress or sunglasses. The exact amount of the fee depends on the country where you apply, visa type and urgency. Tip: Fees are not refunded if the application is denied, so try to avoid mistakes and bring all necessary documents at the same time. This does not imply that you cannot plan your own trip. Tip: All you need is to purchase a voucher from a private enterprise or have your hotel issue it. To do so, a company must be accredited by the Federal Migration Service and the Ministry of Foreign Affairs of Russia, so it is better to choose a reliable source. After you provide your passport details, pay the service fee and receive a confirmation from a hotel, you are all set. Make sure the company's registry number and its stamp are on the voucher. Another option is to book a room at a hotel and send them a letter with a request for "visa support documents." It is common practice to charge the cost of a night's stay for a confirmation voucher. However, after you have been granted a visa, you can cancel the booking and stay somewhere else. Do note that visa centers sometimes verify whether you have actually checked in at a hotel after the fact and they can cancel your visa if you haven't, which can lead to serious problems. So it’s probably not worth the risk. The coverage amount must be at least 30,000 euro. Tip: Your insurance must be valid throughout the entire territory of the Russian Federation, which stretches across Europe and Asia, so do not choose "Europe" only, even if you are not planning a trip beyond the Ural Mountains. The best choices are "Europe including Russia" or "Worldwide." Congratulations, you've made it to Russia! You will be asked to fill out a migration card at the border. Tip: Make sure you depart from the country on the exact date that you indicated on your migration card, even if your visa is valid for a longer period. The only step that remains is to register your visa and we strongly recommend taking care of this as soon as possible after arrival. Not getting registered on time could be discovered at the passport control desk on the day of your departure and could pose a problem for future visa applications. Tip: Your visa registration deadline depends on the choice of accommodation. If you stay at a hotel, in theory its administration will automatically register you within 24 hours after arrival. While this is the case most of the time, be persistent if a hotel administrator comes up with an excuse for why it can’t be done immediately. Also, while technically all hotels should register foreigners, some do not, so confirm in advance. If you choose private-sector accommodations you have seven days to register your visa. You can ask your landlord to register you at the local Federal Migration Service department or the post office. By law, you are required to renew your registration every time you change locations and slacking on this could result in a fine of 2000–5000 rubles ($30-75). Registration checks are quite common on the subway, at railway stations and on suburban trains. Requirements may vary depending on the country where you apply for the Russian visa. U.S. visa centers sometimes request additional documents, such as your bank account statement, a letter from your employer or a certificate concerning the makeup of your family. On the other hand, you can also apply for a three-year multiple-entry visa on the spot. UK nationals have to submit their fingerprints. The Chinese are required to show their plane tickets, while the French have to come up with a detailed plan of their journey if they intend to visit Russian towns off the typical tourist trail. Indonesians are issued visas right at the airport, whereas the Thai do not even need one for visits of up to 30 days. It is highly advisable that you verify all information at your visa center. But do not let the complexities scare you. The first days of your Russian vacation will compensate for all the bureaucratic hurdles you’ve encountered along the way.